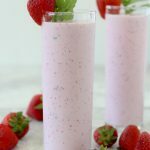 I’ve teamed up with my friends at California Strawberries to bring you the story of Cecilia Zavala and create this Dairy-Free Strawberry Basil Milkshake. I’m honored that I was able to speak with Cecilia about her experiences working as a California Strawberry employee and her path to success. 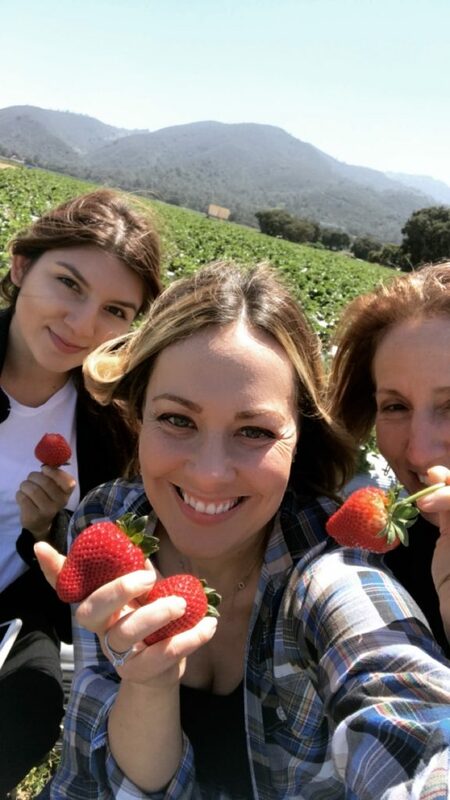 Just about 2 years ago I was able to take a trip down to Monterey with to visit some of their farms and learn all we could about strawberries. It was a memorable trip that I still look back on fondly. I will never forget how amazing it was to sit amongst fields and fields of strawberries basking in the sun and had so much admiration for the workers in the fields. I remember how easy and effortless they made a job look that was certainly not easy. I remember wondering what their story was, what brought them here, who were their families. 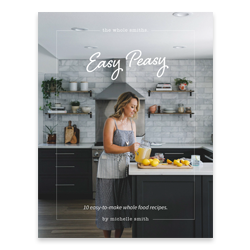 To read more about that trip you can check out my Strawberry + Arugula Salad with Champagne Vinaigrette recipe. 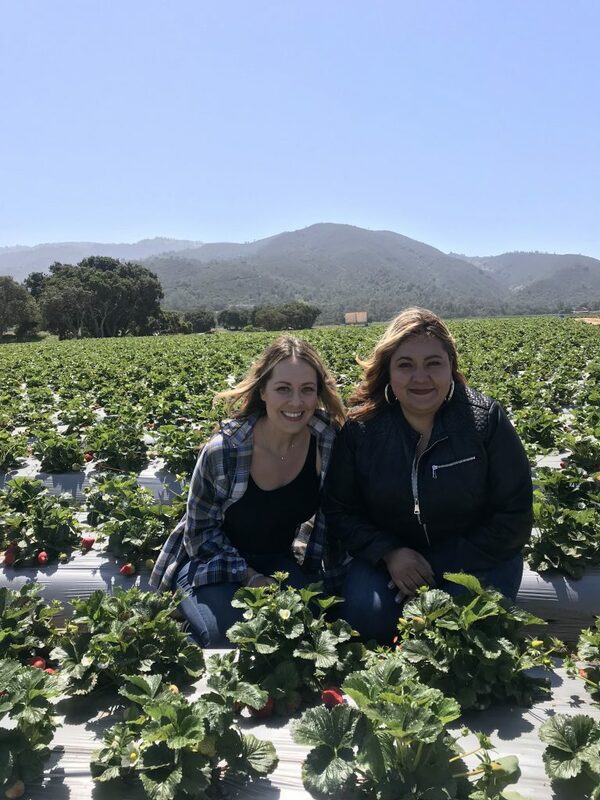 That’s why when I was offered to the opportunity this year to sit down with one of California Strawberries’ farm workers and interview her about her experience working in strawberries I was beyond thrilled. Something I’ve always admired and recognized in people is their resiliency and perseverance, particularly when the odds aren’t necessarily stacked in their favor. I believe humans are built to be able to grow and achieve and when we do that, I love being able to hear those stories. On a warm April day in Salinas I was able to hear the story of Cecilia Zavala. Cecilia was just 14 when her and her father came to California from Mexico to pick strawberries. They had left the remainder of their family behind in Mexico to do so. When I asked Cecilia how she felt about leaving she said she was quite nervous. I couldn’t help but think back to my 14 year old self and how I would have responded had my parents made such a life altering decision and I had so much I was leaving behind. 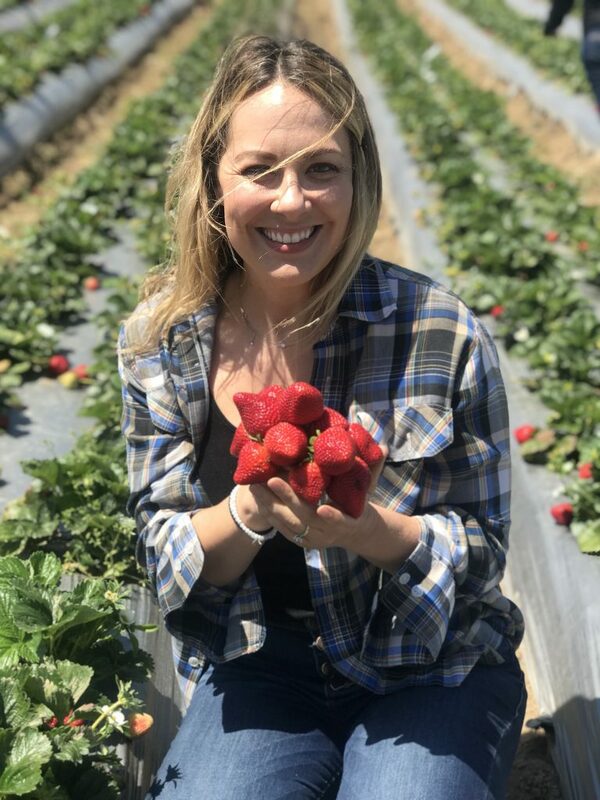 Cecilia started her career off in strawberries as a picker where she stayed for four years until they offered her the job in quality control and has since moved through the ranks and now is an administrator in the office. You can watch entire interview here www.californiastrawberries.com/a-farmworkers-story-of-success/. Despite the fact that Cecilia and I have had different life experiences I couldn’t help but feel a connection to her and her story and it made me realize once again how connected we all our in our dreams and desires. Something in particular that stood out was Cecilia’s desire for more. To learn more, to grow more, to be more. I don’t get the impression that she would ever be content where she was at any given time. 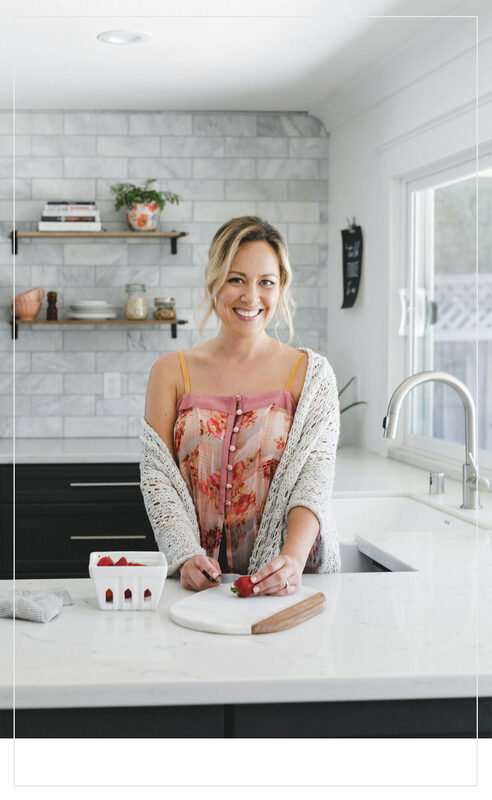 California Strawberries has given her the opportunity to do all of that. As her responsibilities increased , her boss presented her with more and more opportunities, all of which she was appreciative and thankful for. He let her know that in order to move up she would need to go back to school and offered to assist with the costs. She is still enrolled in English and business classes. Despite not loving school as a young girl, she loves it now and hopes that one day her sons will also take classes at the university and continue their education. 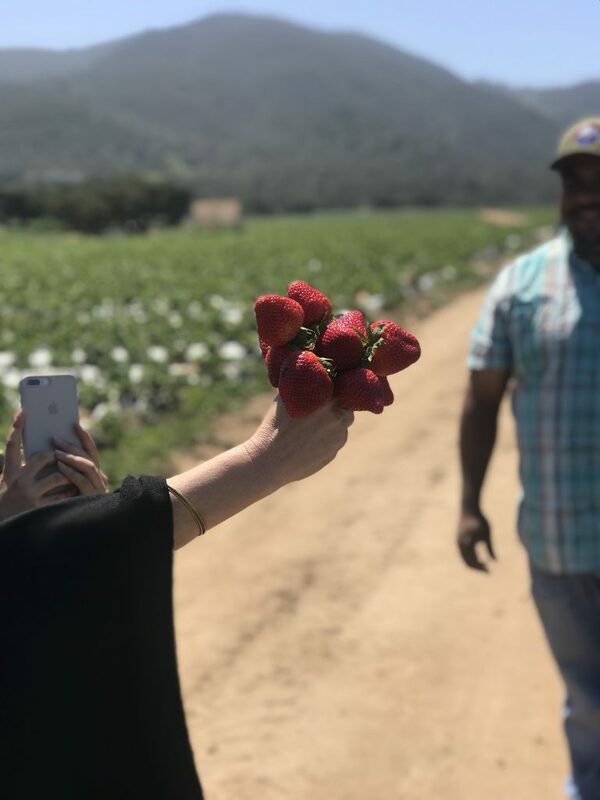 California strawberry farming offers educational opportunities for farmers, ranch managers and crew supervisors, training more than 1,000 employees annually. These workshops provide continuing education for mid-level management workers on the farms so that employees like Cecilia have the opportunity to grow their careers. In fact, strawberry farming has given immigrants more ownership opportunities than any other major crop. 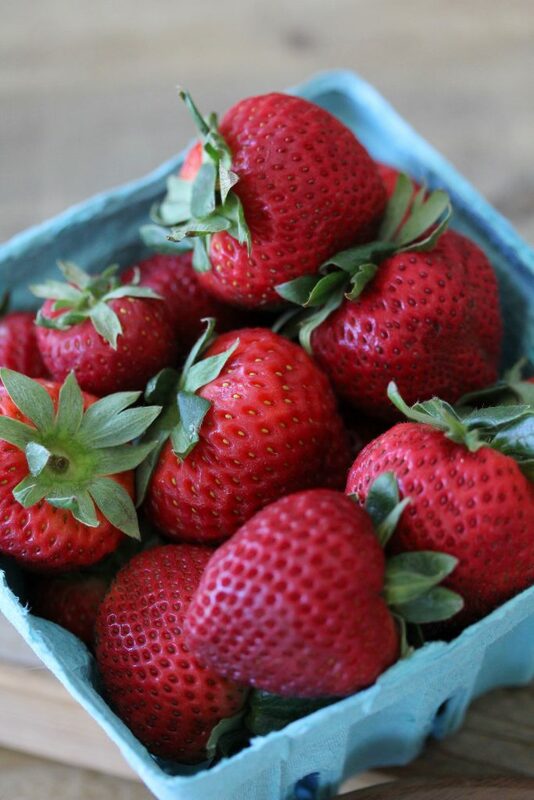 Latinos now comprise two-thirds of strawberry growers in California. 25% started out as field workers. Through small talk I also learned that Cecilia’s favorite vegetable was broccoli (clearly strawberries are her favorite fruit!) and that her favorite way to enjoy strawberries was fresh out of the fields. I can’t say I blame her, there’s something about picking a warm strawberry right from the plant that you can’t beat. I also got to spend some time with David Alvarado in the fields picking and noshing on strawberries. I think it’s safe to say I got my share of Vitamin C for the day considering that just 8 strawberries has 110% of our recommended vitamin C intake. I lost track, but I’m guessing my monthly vitamin C needs were met in just that day based on how many strawberries I ate. Here’s David showing us how to perfectly pick a strawberry. I had such an amazing day with Cecilia, David and the California Strawberry team. It’s a day I won’t forget. 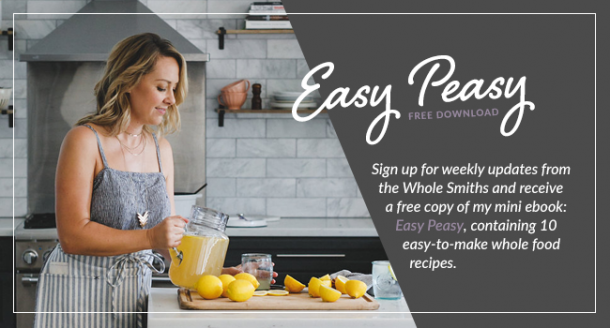 I feel like I met new friends and loved hearing about Cecilia’s journey and I know you will too. I encourage you to hear her entire story and her full interview at www.californiastrawberries.com/a-farmworkers-story-of-success/. Now I bet you’re thinking of how much you want some strawberries? Am I right? 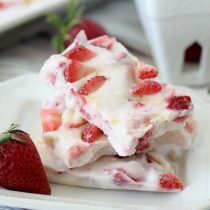 While fresh off the bush is always a perfect way to eat them, strawberries make a great addition to so many recipes. 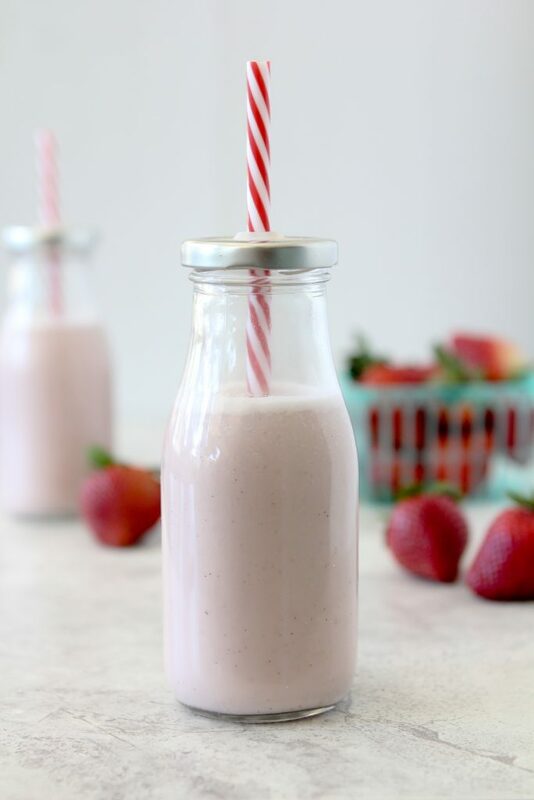 This Strawberry Basil Milkshake is no exception. I mean truly, can you get any more “summer” than strawberries and basil? And a milkshake? I mean, c’mon. 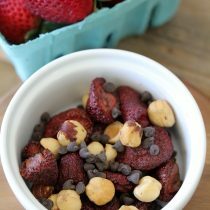 The is the perfect snack for grown ups and kids alike to welcome summer with. While I love the fresh basil in my milkshake, my kids aren’t always a fan of the herb so I simply leave it out for them. If your kids prefer this milkshake basil-less, not a problem. Simply whip up with batch sans the basil, pour theirs into their cups, add the basil into the blender and blend yours up. Presto! The perfect way to #getsnacking. 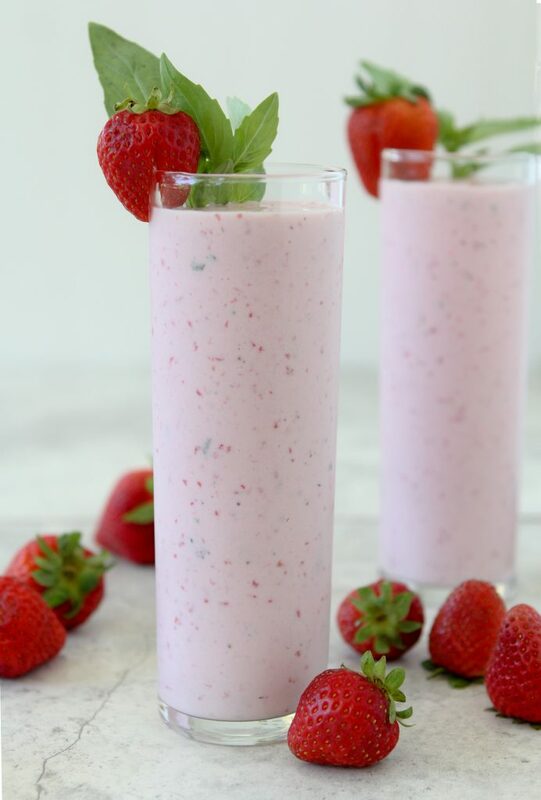 This Dairy-Free Strawberry Basil Milkshake is the perfect way to welcome summer. 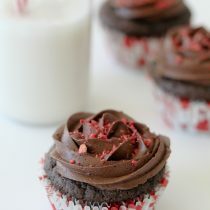 Paleo and so easy to make! Add all of the ingredients to a blender and blend until smooth and combined. Garnish with additional basil leaves and a strawberry.